To mark this year’s Chelsea Flower Show, SW7 is being taken over by a colour explosion. Private member’s club, Albert’s, is amongst those receiving a floral makeover, treating their loyal members to a spectacular frontal display of colour and texture. Commissioned by Albert’s, London based florist, Carly Rogers, has transformed the front of the club. Creating an archway filled with an array of flowers and plants, the installation adds vibrancy and excitement to the Old Brompton Road. Combining classic flowers with contemporary designs, Rogers took inspiration from the Victorian horticulturalist, Jane Loudon, renowned as the driving force behind horticultural popularity in the 19th century. 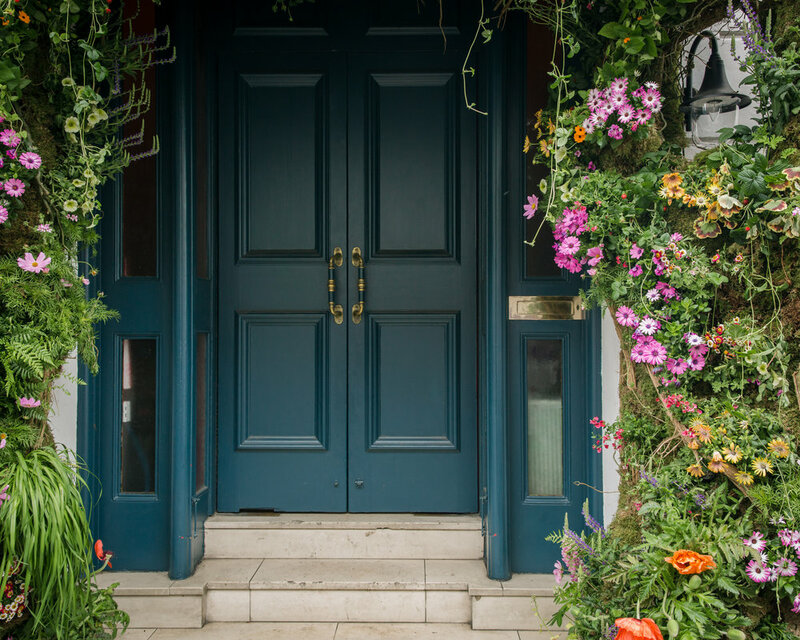 As floral displays make a colourful comeback, the new archway outside Albert’s celebrates all things floristry and gardening, alongside the widely successful Chelsea Flower Show. Since their launch in 2016, the South Kensington private member’s club has experienced great success, with visits from the likes of Harry Styles and Princess Eugenie. Reflected in the club’s design and location, is the deep rooted history of Prince Albert; where the club gets its name from. Similarly, Rogers took inspiration from the club’s namesake, creating the installation as a nod to Prince Albert and Victoria, resulting in a perfect partnership! Described by co-founder, Carlo Carello, as a “match made in heaven”, Carly Roger’s addition to Albert’s classic frontage combines a rich history with contemporary art. Greeting the members as they enter, the archway engulfs the elegant, traditional front doors, creating a floral utopia as you step into the luxurious interiors inside. Created from roses, geraniums, primrose, foxglove and nasturtium to name a few, the innovative installation adds colour and depth to the streets of Chelsea, for the enjoyment of both residents and Albert’s members. Along with other addresses across Chelsea, Albert’s eye-catching display adds to the multitude of colour that has taken over the streets of London. Exceeding everything Kensington and Chelsea has to offer, Albert’s exclusive experience for its members has gained it an incomparable reputation in the area. With the addition of the timely floral exhibition, Albert’s is a recent but excellent addition to the famous Old Brompton Road.